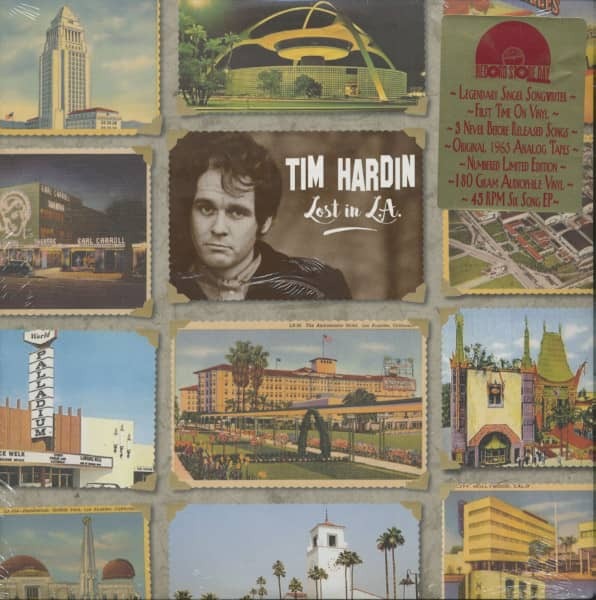 Tim Hardin arrived in Los Angeles, from New York, in late 1964. Like fellow singer songwriters before him, he immediately gravitated to 'TheTroubadour' club where record producer Jim Dickson held 'court' at the club's bar. Jim had a knack for spotting potential artists (the Byrds) who he could record and promote in his role as a staff producer for Elektra, World Pacific and even Warner Bros. Records. Jim had `carte blanche' access to the World Pacific Records studio where he recorded these budding singer songwriters. Tim Hardin was such artist. 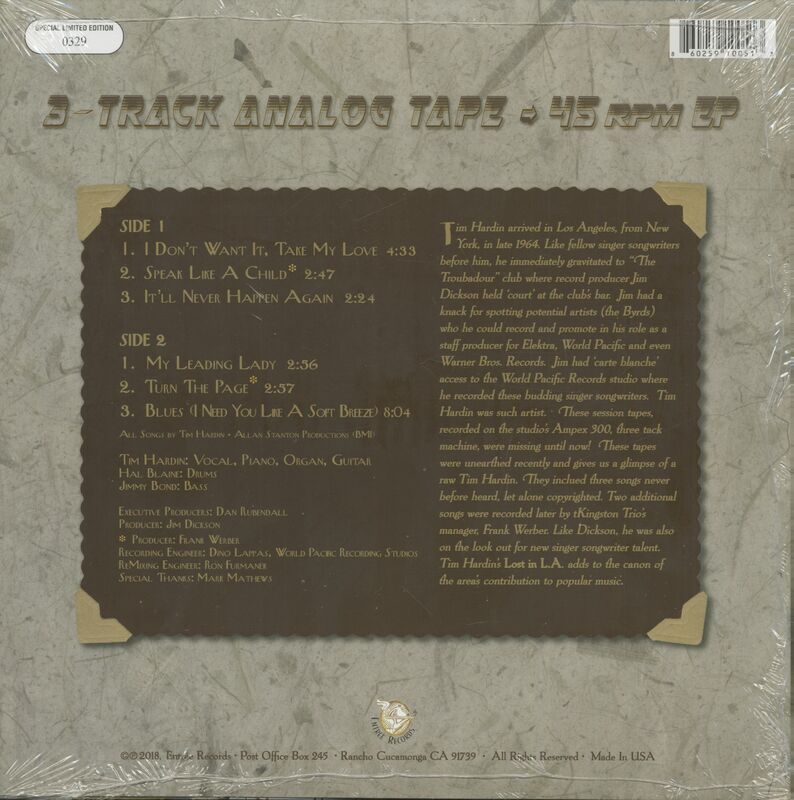 These session tapes, recorded on the studio's Ampex 300, three track machine, were missing until now! These tapes were unearthed recently and gives us a glimpse of a raw Tim Hardin. (They inclued three songs never before heard, let alone copyrighted. Two additional songs were recorded later by the Kingston Trio's manager, Frank Werber. Like Dickson, he was also on the look out for new singer songwriter talent. Tim Hardin's Lost in L.A. adds to the canon of the area's contribution to popular music. Forty years after Woodstock, Josh Tyrangiel looked back at the festival in a 'Time' magazine feature and ranked its ten best musical performances. Joe Cocker's With A Little Help From My Friends topped his list. Tim Hardin's Simple Song Of Freedom, with the oft-repeated line, "We, the people here, don't want a war," was ninth. Timothy James Hardin was born on December 21, 1941 and died of a drug overdose on December 29, 1980. In his brief musical career he wrote hits such as If I Were A Carpenter and Reason To Believe, and recorded material for ten albums. At least ten more albums, including retrospectives, have been released since Hardin's death. When his widow, Susan, spoke to Colin Escott she said that Hardin was furious when Bobby Darin covered one of his songs, If I Were A Carpenter, but by the time he signed with Columbia a few years later he'd run dry as a songwriter and covered Darin's Simple Song Of Freedom. Some say that Hardin's drug problem started in Vietnam, but there's no evidence that he served there when he was in the Marines. He asserted, though, that his platoon corporal was the first American casualty of the war. Heroin addiction and stage fright made him an erratic performer and kept him from touring in support of his music. This lack of exposure may explain why Simple Song… stalled at #50 [Pop] in August, '69, the very week of Woodstock. "What happens in Vietnam halfway around the world, and whether Americans meet their responsibilities there, may affect the future of not only Vietnam, not only the other nations in the Pacific, but the future of America itself." Richard Nixon was elected 37th President on the United States in 1968 by winning 43.4% of the popular vote versus 42.7 % for Hubert Humphrey and 13.5% for George Wallace. Restoring 'law and order' was the central theme of his campaign. It was especially popular with Americans who were concerned about the violence and unrest in the name of civil rights and anti-war causes. Nixon also promised to end the draft but after being elected opted for a lottery. Early in his presidency, Nixon highlighted the importance of Vietnam, acknowledging the war's impact on both foreign and domestic policy. He declared that he would continue America's involvement in the war in order to end the conflict and secure 'peace with honor' for the United States and for its ally, South Vietnam. Long after the Vietnam War ended credible information came to light that Nixon's 1968 campaign team had worked to sabotage the ongoing Paris peace talks by telling South Vietnamese leaders that a Republican, unencumbered by Johnson's policies, would offer them a better deal than a Democrat in their negotiations with the North. If true, the tactic worked. Under Nixon the war went on another 3 ½ years and cost nearly 21,000 more lives. Customer evaluation for "Lost In L.A. (LP, 180g Vinyl, 45rpm, Ltd., RSD)"